Iran's envoy to the U.N. nuclear watchdog agency said Saturday the Islamic republic had reached a "basic deal" with the Kremlin to form a joint uranium enrichment venture on Russian territory, state-run television reported. Ali Asghar Soltanieh, envoy to the International Atomic Energy Agency, "spoke of a basic agreement between Iran and Russia to set up a joint uranium enrichment firm on Russian soil," Iranian state television reported. It remained unclear, though, whether Iran would entirely give up enrichment at home, a top demand of the West, or whether the joint venture would complement Iran's existing enrichment program. Enriched uranium can be used to fuel nuclear reactors that generate electricity or to make atomic bombs. "Only issues regarding technical, legal and financial matters remain to be resolved which need more deliberation and exchange of views," the television quoted Soltanieh as saying Saturday in Moscow. Soltanieh made the comment on the sidelines of an energy conference. Russia and state television gave no details on the deal. In February, Iran and Russia announced that they had reached a "basic agreement" to establish a joint uranium enrichment venture in Russian, but details were never worked out. Iran has vowed it would never give up its right under the Nuclear Nonproliferation Treaty to enrich uranium and produce nuclear fuel. The United States has accused Iran of using its civilian nuclear program as a cover to build weapons. Tehran has rejected the charges, saying instead that its nuclear program is geared merely to generating electricity. 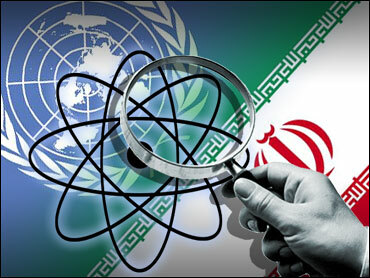 The U.N. Security Council has given Iran until April 28 to cease enrichment of uranium. The council has the power to impose economic and political sanctions. But Iran has rejected the council's demand and announced earlier this month that, for the first time, it had enriched uranium with 164 centrifuges, a step toward large-scale production. The United States and Britain say that if Iran does not comply with the Security Council deadline, they will seek a resolution making the demand compulsory. Earlier this week, a U.S. diplomat said that envoys from the five permanent Security Council members plus Germany discussed sanctions against Iran over its nuclear program, but failed to agree on how to proceed. Undersecretary of State Nicholas Burns told CBS Evening News anchor Bob Schieffer Tuesday that although the nearly three hours of talks failed to lead to agreement on sanctions, the diplomats did agree "that Iran should hear a stiff message from the international community" that it shouldn't have a nuclear program. He said the possibility of sanctions was discussed during the meeting hosted by the Russian Foreign Ministry, but indicated that further talks would be needed. "Iran's actions last week provoked deep concern, and all of us agreed (they) ... were fundamentally negative and a step backward," he told The Associated Press. "So now the task for us is to agree on a way forward." Burns reiterated that the United States expected action in the Security Council after an April 28 deadline for Iran to stop uranium enrichment. He gave no specifics as to the type or timing of sanctions and he refused to say whether Russia had softened its opposition to sanctions against Iran. Burns told Schieffer that military action against Iran was a possibility. "I think President Bush and Secretary Rice know that we simply cannot tolerate the image of Iran or the reality of Iran with a nuclear weapon. Not (with) this radical government that's leading Iran today." This echoed comments by President Bush earlier Tuesday. During a Rose Garden news conference, Mr. Bush said "all options are on the table" to prevent Iran from developing atomic weapons. But he also said he will continue to focus on the international diplomatic option to persuade Tehran to drop its nuclear ambitions. "We want to solve this issue diplomatically, and we're working hard to do so," he said. Mr. Bush also said there should be a unified effort involving countries "who recognize the danger of Iran having a nuclear weapon," and he noted that U.S. officials are working closely nations such as Great Britain, France and Germany on the issue. The United States and Britain say that if Iran does not comply with the U.N. Security Council's April 28 deadline to stop uranium enrichment, they will seek a resolution that would make the demand compulsory. But Russia and China remain wary of sanctions.